America has just done the unthinkable. Somehow, against all better sense, and in opposition to almost every single poll and predicative data model, it has elected as its next president, a man who has unapologetically flaunted himself as a xenophobe, a racist, a misogynist, a homophobe, a liar, a bully, emotionally unstable and a narcissist. 370 prominent economists signed an open letter issuing a strong warning against voting for Trump, describing him as a “dangerous, destructive choice” for America. I didn’t seem to help. This country has just signed up for a four year prison sentence – one that will largely result in the unraveling of much of the progress we’ve seen over the last 8 years under the Obama administration. Of even greater concern are the appointments that will be made to the Supreme Court – those will have a sweeping resonance that will be felt for the next two to three decades. Mike Pence has already said that Roe vs. Wade will be overturned if he and Trump get into the Whitehouse. This administration’s SCOTUS appointments could go a long way to see that pledge become a reality. Some will argue that it was due to the votes that Jill Stein and Gary Johnson pulled from Clinton was just enough to tip the scales, and for what it’s worth, they may well be right. Neither of the mainstream candidates managed to receive 50% of the votes cast. But I think there’s something much bigger at play. We’ve been watching it for the last decade, if not longer. During the financial meltdown, great swaths of our population had become dispossessed; they had seen (and continue to witness) the staggering momentum of the growing income inequality; they have become painfully aware that the financial sector and lobbyists control the decisions that get made in big government, and as a result that they are the beneficiaries as well. These are the people who have become disenfranchised in every aspect of their lives, and have rightfully come to feel righteously indignant towards our nation’s government. These people have come to believe that there is nothing left to lose. For many of them, that belief is correct, and for many of them, they are us. These sentiments have been felt across the entire political spectrum. The anger and disenfranchisement has become part and parcel of the very fabric of our political consciousness. I believe that these are the forces spawned both the modern Tea Party as well as the Occupy movement five years later. Bernie Sanders’ ascent was the opposite end of the same spectrum that brought forth the supporters of our now future president, and once the information that the DNC colluded to keep Sanders from any real shot at the nomination became public, a powerful block of energized voters suddenly felt doubly marginalized by the political establishment that they were already feeling so much anger and frustration towards. The DNC made a fatal judgment error and now the rest of us are going to pay the price. As a result, voter turnout in 2016 was unimpressive. 2016 marked the first time in Unites States history when voter registration crossed the 200 million mark (200,081,377 if you want exact numbers), and yet the total number of votes cast in the this presidential election was 128,843,000. Let’s break that down. ~64.4% of the people registered to vote actually showed up at the polls, and the remaining ~35.6% (71,238,377 million people) did not participate – more than actually voted for either Clinton or Trump. Clinton received 59,923,033 votes (47.7%) and Trump received 59,692,978 votes (47.5%). In the grand scheme, this margin is razor thin, but the fact remains that she received 230,055 more votes than he did. This is significant and points to the ultimate flaw in the Electoral College system. Trump is the fifth president in U.S. history who has won the Electoral College, but lost the popular vote. The last time was George W’s first term in 2000. The last time before that was in 1888. When you compare this with the presidential election from four years before, the difference is notable. In 2012, there were 146,311,000 registered voters in the U.S. and 129,085,410 of those people turned out to the polls. Of those votes cast, Romney received 60,933,504 votes and Obama received 65,915,795 votes. So, by comparison ~88% of the registered voters made it to the polls and the losing candidate (Romney) received more votes in 2012 than either Clinton or Trump did in 2016. And there were 50 million FEWER register voters in America in 2012! Let that sink in. Andrew Sullivan’s article America and the Abyss just days before the election portended some catastrophic times coming our way explaining that Trump has “long treated the truth as entirely instrumental to his momentary personal interests,” and points to the fact that with a Trump presidency, a Fascist ideology will be voted into power. Thank you America. I expect that the GOP will be emboldened to a degree that will make the last eight years of obstructionism seem like child’s play. And the last eight years will only be the beginning, if they get their way. Things are going to get really uncomfortable for those of us who identify as progressives and liberals, and for those who cast their vote in support of this vindictive, thin-skinned megalomaniac, the reality of what they’ve done will begin to sink in as this administration slowly does what they can to unravel what social safety nets do exist. Indeed. I have seen a slice of America that I never wanted to believe truly existed, at least not to this degree. I believe we are entering into a sad chapter for our nation, and while I refuse to believe that the sky is crashing down upon us, I cannot support an administration that stands so violently in opposition to everything I believe in. It’s okay to stand against that which is wrong. Thanks Daniel. Feeling the same way. Appreciate this. Wow, really shocking shortfall that clearly made the difference. How many people that we know just didn’t vote. I assume alot fell into the quagmire of righteous disdain for dnc and their anti Bernie BS. 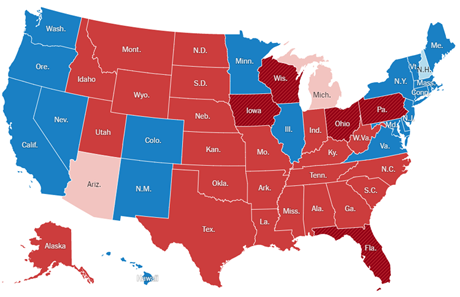 It is time for us to stop thinking it’s impossible to get rid of the electoral college. Made up of political millionaires, they took the popular vote down the toilet. Thanks, Daniel. And just read Farewell, America. Gut punch. Most dead on thing I’ve read.